Some of the best toys we’ve ever received have been hand-me-downs — well-loved favourites passed down from friends and family. 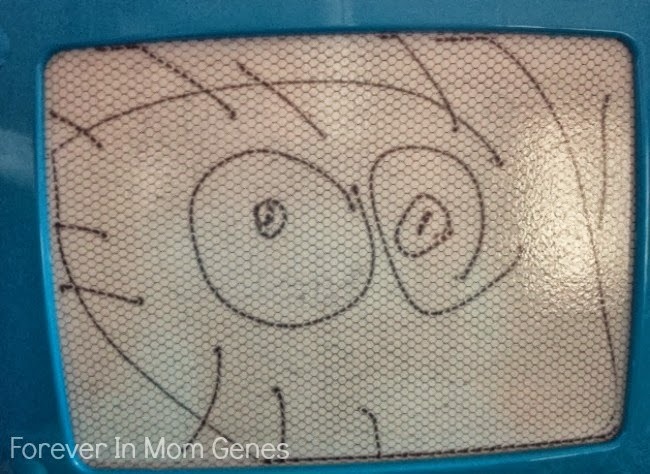 When my son was little, a friend gave us their *Doodle Pro. Several years, thousands of shapes, one and two syllable words and stick figures later, this toy began to look a little worn. The magnet stamps were long since missing and the magnetic slide eraser was no longer erasing as well as it did. There’s a reason this toy is called the Doodle Pro Classic Doodler. It IS a classic; one that we use daily at our house. So once we said farewell to our old Doodle, I promptly bought a replacement ($19.99 at Target). Still the same concept, the newer version now has magnetized sections to hold the stamps so they won’t fall out and get lost. No doubt this design update was contributed by a parent who has crawled on hands and knees to look under the couch for missing stamps. I’ve used the Doodle Pro to jot down a phone number, as a notepad for lists, for a game of Hangman, to sketch out our new kitchen plan and to write an expletive message displayed in my husband’s direction when the kids weren’t looking. This eco-friendly paperless sketch pad has all kinds of adult uses too. My son frequently uses it as a scratch pad for his math homework, but ultimately my daughter gets the most use out of it. Every morning the kids work at the table while I make breakfast and put together their school lunches. Avery practices writing her name and printing her spelling words on the Doodle Pro. Mistakes are a mere swipe away which saves paper and masterpieces can be preserved with a click of my iPhone. This may not look like a masterpiece to you, but for a kid with fine motor issues, this is a fricken’ Rembrandt! If you’re looking for an inexpensive gift that is both fun and functional, this is a great one. It also comes in a smaller travel size perfect for stowing in your purse to have on hand for appointments or any time you need to keep your little one occupied. FYI the pen is tethered to the centre so lefties and righties can sketch with ease.